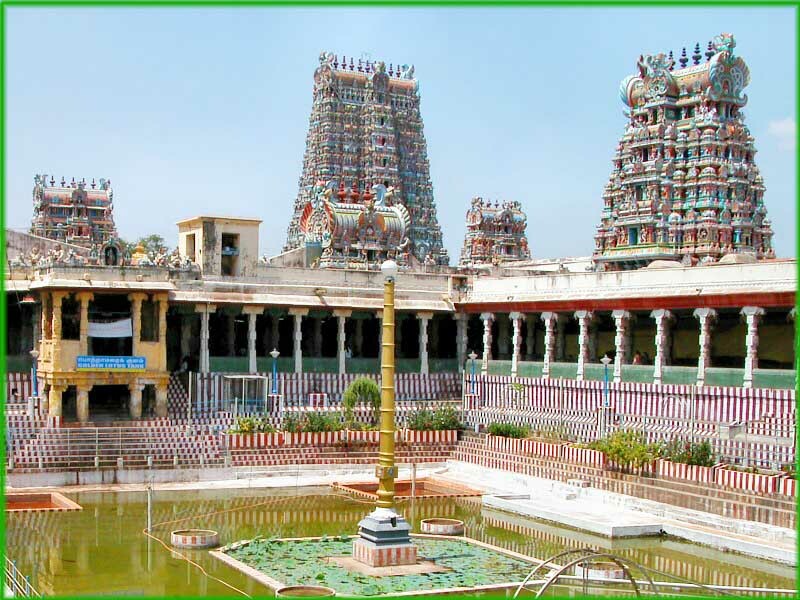 Madurai is one of South India’s great temple towns, It is synonymous with the celebrated Meenakshi Temple. Situated on the banks of river Vaigai, Madurai has a rich cultural heritage passed on from the great Tamil era more than 2500 years old. Madurai was an important cultural and commercial centre even as early as 550 AD. It was the capital city for the great Pandyas kings. The Pandyan king Kulasekarar built a great temple and created a lotus shaped city around the temple. On the day the city was to be named, as Lord shiva blessed the land and its people, divine nectar was showered on the city from his matted locks. This city was henceforth known as Madhurapuri. Madurai is famous for jasmine Flowers. One of the oldest cities of India is Madurai, with a history dating all the way back to the Sangam period of the pre Christian era. The glory of Madurai returned in a diminished form in the earlier part of this millennium; it later on came under the rule of the Vijayanagar kingdom after its ransack by the ravaging armies of Delhi (Malik Kafur). During the 16th and 18th centuries, Madurai was ruled by the Nayak Emperors, the foremost of whom was Tirumalai Nayakar. The Sangam period poet Nakkeerar is associated with some of the Tiruvilayaadal episodes of Sundareswarar - that are enacted as a part of temple festival traditions even today. The Cholas ruled Madurai from 920 AD till the beginning of the 13th century. In 1223 AD Pandyas regained their kingdom and once again become prosperous. Pandian Kings patronised Tamil language in a great way. During their period, many master-pieces were created. "Silapathikaram", the great epic in Tamil was written based on the story of Kannagi who burnt Madurai as a result of the injustice caused to her husband Kovalan. The Raja Gopuram of the Meenakshi Amman Temple, The Pudu Mandapam and The Thirumalai Nayakar's Palace are living monuments to his artistic fervor. The history of Madurai will not be complete without mentioning the name of RaniMangammal, the woman of great skill and sagacity. History does not provide many instances of ruling queens in Tamil Nadu. Though it was considered that women were not suited to succeed the throne of a kingdom, Rani Mangammmal, however shines in almost solitary eminence as an able and powerful ruler in Tamil Nadu. Madurai is famous for its temples. The Aappudaiyaar Koyil Tevara Stalam and the Koodalazhagar Divya Desam are the most important temples one should rarely miss to go. In the vicinity of Madurai is Tirupparamkunram, one of the 6 padai veedu shrines of Murugan (glorified in Madurai Sangam Nakeerar’s Tirumurugaatruppadai). Also in the vicinity of Madurai is Alagar Koyil, one of the prominent Divya Desam shrines of the Sri Vaishnavite faith.